Apple streamlined iCloud storage options during its Worldwide Developer Conference by removing the 1 TB option and lowering the price for 2 TB. The 1 TB option that’s been eliminated cost US$9.99 a month, and 2 TB was priced at $19.99 a month. Now 2 TB costs $9.99, and iCloud users who were paying for 1 TB storage have been automatically upgraded to 2 TB. Lower inline storage capacities are unchanged with 5 GB available for free, 50 GB for $0.99, and 200 GB for $2.99 a month. 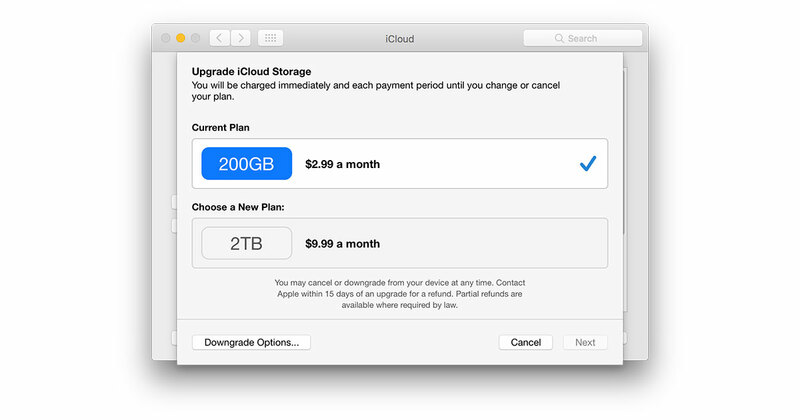 Dropping the monthly price on the 2 TB plan makes iCloud’s higher storage option more affordable. It also plays nicely into one of iOS 11’s new features: shared iCloud storage for families. The new iCloud pricing quietly rolled out on Monday after Apple’s WWDC keynote presentation where iOS 11, macOS High Sierra, watchOS 4, and tvOS 11 where shown off. Apple also unveiled the iMac Pro, Kaby Lake iMacs and Touch Bar MacBook Pro models, the 10.5-inch iPad Pro, and HomePod. Apple changed iCloud storage pricing in other countries, too. You can check out the revised pricing for other countries on Apple’s web site.